Is this the purest form of eco-tourism in the world? Once upon a time, wandering ascetics in search of the sacred site of Lord Kataragama discovered a place that became known as Ulpotha. Protected at the foot of Galgiriyawa Mountains that form the backbone of Sri Lanka and surrounded by seven hills, it became a pilgrimage site for thousands of years. One day, Viren Perera, an investment banker from Colombo, bought on a whim what had become an abandoned coconut estate. Fuelled by his passion to return to traditional farming methods, he and his partners – Giles Scott and Mudiyanse Tennekoon – embarked upon reforestation and rebuilding the crumbling manor house. It was a labour of love of fairy-tale proportions. From the dust rose a working village and a welcome retreat for family and friends. However, the farm was not self-sufficient and it was decided to open up the village for paying guests for just 22 weeks year in order to minimize damage to village life. To this day, Ulpotha remains a pure form of eco-tourism; all the funds generated by guests are ploughed directly back into the fields. I arrive at Ulpotha as the sun is fading after a three hour drive through lush countryside from the fevered streets of Colombo. The steps of the colonial style manor house (Walauwwa) are illuminated with tea-lights and oil lamps reveal smudged outlines of Buddha paintings and bowls of intricately floating flowers. Viren urges me to explore and investigate “the tank”. Unaware this is the name for a man-made reservoir and expecting nothing more than the name suggests, I hear my own intake of breath as a lotus-strewn lake unfolds in the green-blue dusk. Surrounded by hills and on the farthest side the glimmer of a light from a Buddhist temple, it’s the best swimming pool I’ve ever experienced. Later, a thick felt darkness descends, punctured only by the brightness of stars and the oil lamps. Living in a light polluted city it’s easy to forget how calming true darkness can be. Ulpotha’s organic beginning still permeate its spirit. The atmosphere is one of an extended and extremely mellow house party. If you are looking for a five-star resort where you luxuriate in deferential service and cocktails by the pool, this place is not for you. Ulpotha is wholeheartedly a down-to-earth affair where your shower is bracing water from an ingeniously funneled tree trunk and where, by design, there is no electricity. The villagers who light your lamps at night and cook your food return to the fields when you are gone. Every care has been taken not to impose western lifestyle upon the village. Accommodation follows these lines in traditional mud and wattle huts, some beautifully fashioned, with low hanging roofs that are open to the elements. Crickets provide background music for sleep but ear plugs are advised for the occasionally deafening frogs. The best thing at Ulpotha is that you are allowed to be a kid again. Don’t worry – there’s no getting in touch with your inner child, unless you want to, of course. But there are tree houses to climb and sleep in; rocks to clamber on and watch the sun set like a burnished mango over a sweeping expanse of jungle; the tank to swim in; huts to discover by a dug-out canoe. My raison d’etre, though, was the yoga. You are free to skip this entirely and retire to a hammock if you are not so inclined, but for those who are, the morning session of postures and breathing provide a structure to the day and a newly found suppleness. The yoga teachers change every two weeks, so check that there is a discipline to suit you as some forms of yoga are more taxing than others. Gingi Lee, who teaches Astanga at the Sangam Centre in London, encourages me into asanas (yogic postures) that stretch the spine and release tense muscles. Astanga is the most dynamic form of yoga that, through Vinyasas (breath connected movements), creates a detoxifying heat in the body. Sweat dripping off the end of my nose is not something I was used to in yoga but, after a two-hour session every morning for two weeks, my skin takes on a distinct glow. Qualified reflexologists and masseurs are also on hand here. I get the massage of my life from Clare who holds onto a rope suspended from the roof and literally walks up and down my spine, using her toes like fingers to ply knotted muscles. Ninety minutes later she says: “You can get up now”. I find my limbs have turned to jelly. “No, you don’t understand,” I say, ”I can’t move.” You can also visit the village doctor for an ayurvedic treatment. Curiously, whatever the problem the remedy seems to be the same. A facial scrub with sandalwood paste that makes you look as though you were permanently blushing, and a steam in a wicker basket balanced over a pot of herb-infused water. The following hot-water scrub is delicious as the monsoon kicks in. All this is enough to make you hungry. Ravenous appetites are sated with a feast twice a day. Meals are a social event in the Ambalama (travelers resting place), where, lounging on cushions, it’s possible to sample organic red rice grown in Ulpotha, (there used to be hundreds of varieties of rice, most of which have become extinct) and at least 12 other dishes, such as yams in coconut milk, aubergines, jak, and breadfruits and dahl. There are also freshly pressed juices from the local trees; mangoes, papayas, woodapples; and hot herbal teas. It’s difficult not to detox here. I realize later I had no wheat, dairy, caffeine or alcohol and virtue wasn’t even on my list. Pace of life here is slow and it takes time to relax into the sedate serenity of it all. I visit the kitchen one day to see Bandara, the head cook preparing the food. You don’t rush things in Sri Lanka. Grating coconuts and preparing vegetables begin in the early light. Cooking is done as it has been for centuries, with pots on a wood fire balanced on a stove hollowed out of dried mud. One of the women is making sambol – grated coconut and chili, crushed and mixed between stones with a dash of lime – which gives a kick to any dish. One benefit of Ulpotha’s geographical position in Sri Lanka’s heartland is it’s proximity to cultural sites. 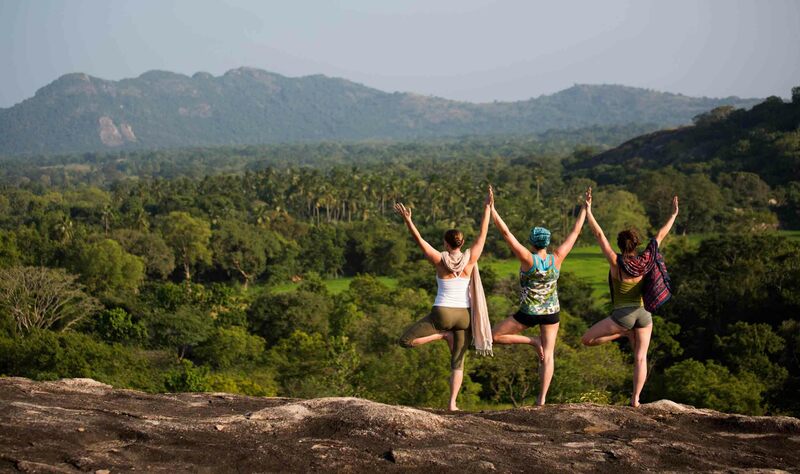 We reluctantly leave the oasis for a day trip to Polonnaruwa to find reclining Buddhas, and enjoy lunch by a lake and a canoe ride and trek across the plains to see a herd of elephants. Hours of the trekking and much paddling later, patience pays off with the sighting of a herd, albeit from afar. But it would have been difficult to return home from Sri Lanka without seeing an elephant – regardless of their proximity. Later that week an impromptu party is thrown by the lake. The villagers play drums and perform acrobatic dancing fuelled by arrack – a local toddy of dubious taste brewed from coconuts. The luxuries in Ulpotha are those that only living close to nature can bring. There are no keys to lock up your room; you need handle no money. Freed from all the trappings, you’re free to enjoy the stars at night, dawn swimming, vivid dreams, a toned and stronger body, the sound of crickets at night and the company of others in candlelight. I have come to realize that it’s the simple things that make you happy. For the founders, it is a realization of a dream in which Ulpotha almost equals utopia.